Fish Soup Recipe - low fat and delicious! A basic fish soup recipe is a must for every Mediterranean diet plan. Fish not only helps you to burn fat, but it also contains specific omega 3 fatty acids which are not readily available in other foods. When you don’t have the time to prepare complicated dinners every night, it’s fabulous to make up a big pot of soup and then eat it over a few days. This light recipe just gets more flavorful over time as it soaks up the piquancy of the herbs and vegetables and of course the fish! What’s great about this recipe is that it’s not loaded with fat yet it satisfies like a chowder. To make it low glycemic I have reduced the red potatoes by half. They add just enough richness but not too much starch. The freshness of the fish makes all the difference so eat it the day you buy it. This is one of our printable low glycemic index recipes. Rinse and clean the shrimp. Combine all the fish, 6 cups of water and half the thyme in a large kettle or pot. Simmer over medium heat until the water comes to a boil. Turn off the heat, remove the fish and set aside. Reserve the fish stock in the pot over low heat. Cut the lemon grass into 2 inch lengths. Take the end of your carving knife and pound the lemon grass until it is a bit mashed so it will release it's flavors when you add it now to the fish broth. You will be able to smell lemon grass aromas as it simmers and you will know you are in for a treat. In another medium sized soup pot heat the coconut oil over medium heat. Add the onions, the rest of the thyme, the garlic and sauté for 5 minutes. Then add the celery leaves and sauté 5 minutes longer. Add the potatoes to the pot with 3 cups of water, the vegetables you've just cooked and all the seasonings. You can squeeze the juice of half a lemon into the pot and adjust your seasonings to taste. Simmer until the potatoes are tender, about 10 minutes. Return the fish to the pot with the stock and add the cilantro saving a few pinches. Simmer a minute or two just to reheat the fish. Turn off the heat so the fish and potatoes are chunky and firm. Ladle into soup bowls and put a pinch of cilantro on each bowl. This will serve 4 people with plenty of left overs. The lemon grass, which can be found in most markets now, makes this soup really special and gives it more of a Thai style. The celery leaves and cilantro are very complementary flavors for the lemon grass. However, this simple recipe takes on a new life with different vegetables. Instead of the celery leaves, cilantro and lemon grass try it with 2 or 3 chopped tomatoes added to the onions, garlic and thyme. This makes it more of a fish stew. I also sometimes substitute 2 cups of fresh spinach for the celery leaves. Buy the already washed spinach and you don't even have to chop it. Whatever style you give it you can serve this fish soup recipe with a simple green salad and you have a complete meal. It actually tastes better the second night after the flavors have had time to mingle! This fish soup recipe and it's variations is the easiest way to eat fish a few times a week. Buy your fish wild and caught in Alaskan or Canadian waters when possible because their waters are less polluted than U.S. waters. Prawns, however, can be bought farm raised according to Seawatch. Check out the resources below for the latest information on which fish is sustainably caught in your area and not subject to polluted waters. Go to Seawatch at the Monterey Bay Aquarium site or to the guide at Blue Ocean. 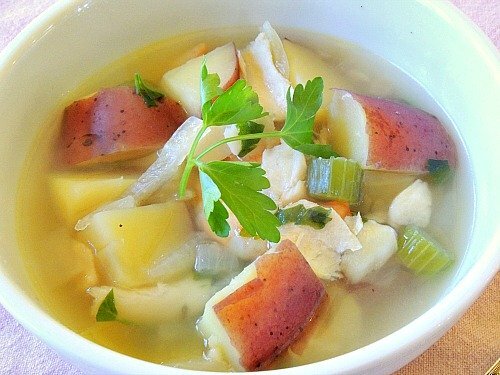 Return from Fish Soup Recipe to Low Glycemic Recipes. Return from Fish Soup Recipe to Lifetime Fat Loss home.